Who likes doing paperwork, washing up and taking the rubbish out? Thought not! This is relevant as P11D submission day (6 July) and a friend’s Stag Do is on the agenda. In both cases you need to ask for dispensation to get out of usual duties. As every married man knows a request for dispensation from family life must be timed perfectly. Get it wrong and risk receiving a look that is similar to someone who has been told that Santa doesn’t exist. A look of disbelief and anger followed by a threat of violence. Thankfully Mrs TTF is a very understanding, beautiful, amazing woman (yes I used all of these superlatives and more when asking for a leave of absence) and she agreed surprisingly quickly. The employee must then submit a claim to HMRC confirming the expenses have been incurred wholly, exclusively and necessarily in respect of their employment to avoid a tax charge. All claims for reimbursed expenditure must be accompanied by supporting receipts. Someone other than the claimant must check the expenses to ensure they are allowable under PAYE and NIC legislation. It is therefore important that there are procedures in place to ensure the above conditions are met. To know what can and can’t be claimed is complicated. It is therefore highly recommended that an expenses handbook is prepared and distributed to all staff to ensure that everyone is aware of the procedures. As with weekends away you have to request for a PAYE dispensation. This can be applied for using HMRC form P11DX. A dispensation can be back dated to the beginning of the tax year that the claim is made. Therefore if you do not have a dispensation for the previous tax year you will still need to include the expenses to your P11ds. 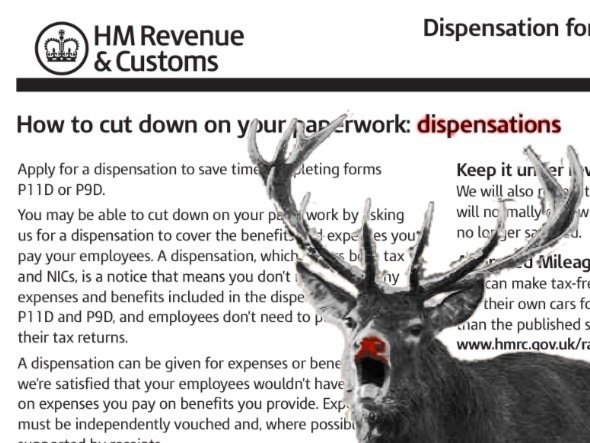 Once received HMRC can withdraw the dispensation at any point. It is therefore important to make sure that your procedures are followed to the letter in the event of a PAYE inspection. So now I’ve been granted dispensation for a weekend away I’m just waiting for the conditions.